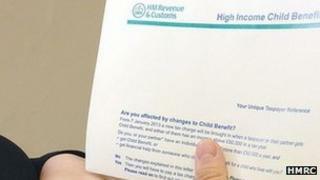 One million households will receive letters from the UK tax authority this week about losing child benefit. Households where at least one person earns more than £50,000 will have the benefit reduced or stopped. Officials say it means as many as 500,000 parents may have to complete self-assessment tax forms. A flood of calls for advice is expected. Ministers say the changes, which take effect on 7 January, are needed to help the deficit reduction plan. However, Deputy Prime Minister Nick Clegg described the coalition's plan as an "excruciatingly difficult decision". Mr Clegg told an audience that "we don't expect them to welcome this" and he admitted that many of the families who would lose out were "people who do not feel wealthy". Letters will be sent to people who earn more than £50,000 who live at an address where child benefit is received to explain how their family is likely to be affected. Alison Garton and husband Rod have a three-year-old daughter called Megan. They live in Sittingbourne in Kent and owing to the new rules are set to lose most of their child benefit. "We live in one of the most expensive parts of the country, meaning that our income just about supports a mortgage on this type of property," said Mrs Garton, 41. She believes that there is a lack of fairness in the way the changes will come into force. The benefit money that was used to pay for nappies, and now clothes and shoes, will not be replaced. "I work part-time in London, but my salary just supports my train fare. I work because the government is encouraging us to go back to work," she said. "I don't think the system is fair, we pay in a lot, but get very little in return." keep getting child benefit after this date and declare the payments for income tax purposes"
Child benefit currently stands at £20.30 a week for the first child and £13.40 for each child after that. Under the new approach, families where one parent earns between £50,000 and £60,000 will have their benefit reduced on a sliding scale, and will only lose the benefit entirely when earning over £60,000. The change will cost families with three children and at least one parent earning more than £60,000 about £2,450 a year - the equivalent of a £4,000 pay cut. And it will produce anomalies, such as in the case of two-earner households where both parents earn £49,000. They will keep all their benefit, while others who have one parent on £60,000 and the other staying at home will lose all of theirs. However, the details mean that people earning between £50,000 and £60,000 will benefit from some child benefit - so are likely not to want to cancel it entirely. This means that hundreds of thousands of parents will have to complete a self-assessment tax form. Accountants say they expect calls from people confused by the change, or looking to avoid losing benefit by legal means, for example, making additional pension contributions. Meanwhile, senior Conservatives have released poll results that suggest 82% of the public support plans to cut child benefit for high-earning families, while 13% oppose it. Populus surveyed 2,066 British adults between 24 and 26 October. A Treasury spokesman, responding to the poll, said: "In a period when the government is having to reduce welfare spending, it is very difficult to justify continuing to pay for the child benefit of the wealthiest 15% of families in society. "The unprecedented scale of the deficit has meant that the government has had to make tough choices to reduce public spending; but we have always been clear that those with the broadest shoulders should carry the greatest burden." The spokesman added that 85% of all families with children would be unaffected by the changes and would continue to receive child benefit in full. Meanwhile, new guidance has been outlined for families which expect one parent to earn more than £60,000, and so do not claim child benefit, but who subsequently have a fall in income. They will now be able to claim the benefit retrospectively, which might not have been the case under the original legislation. "For many people, especially those with fluctuating income or who gain or lose a partner or who do not know which partner has the higher income, this is still going to be difficult. And, of course, for HMRC, who have to administer it all," said Patrick Stevens, president of the Chartered Institute of Taxation.